Speedo Fastskin 3 is the revolutionary new collection from Speedo. Speedo is always on the cutting edge of what’s hot and new in technology, fashion and function. Speedo launched Speedo Fastskin 3, which is in compliance with all FINA regulations. This is fantastic news for competitive swimmers around the globe. Olympic gold medalist, Michael Phelps has said Speedo Fastskin 3 makes him feel “at one with the water.” If Speedo Fastskin 3 does that for a man who practically lives in the water, imagine what it will do for your own performance. Speedo Fastskin 3 consists of three products. The Speedo Fastskin 3 swim cap was developed using 3D head scans. This ensures it fits tight without constricting blood flow. It wraps every curve with ease, making it simple for a swimmer to dive right in. 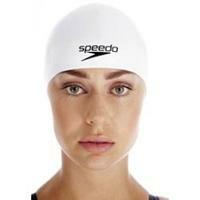 The Speedo Fastskin 3 swim cap wraps each contour and ensures a seamless fit with its hydrodynamic results. When worn with the Speedo Fastskin 3 goggles, the swim cap can reduce a swimmer’s full body drag by over 5%. Competitive swimmers know each second matters. The Speedo Fastskin 3 goggles are comfortable and leak resistant. These goggles were designed for minimal movement while swimming. This means a competitive swimmer does not have to worry about goggles slipping or allowing water in while they swim. Perhaps most impressive is the Speedo Fastskin 3 Super Elite Swimsuit. This swimsuit utilizes technology at its best. High power compression is created with Hydro K-Zone 3D fabric. This fabric moves with the body. Webbing at the framework creates a tight, compressed feeling that allows swimmers to feel minimal weight as they make their way through the water. Speedo has utilized an outstanding team of researchers, scientists and coaches when developing the Fastskin 3 collection. When worn all together, swimmers can expect increased performance due to the technology that inhabits each product. Speedo also consulted sports psychologists when creating Fastskin 3. The grey-blue tint of the goggles ensures a calm and focused approach to any swim meet. Speedo continues to push the envelope when it comes to competitive swimwear. Speedo has become the name you can trust when purchasing practice gear and competitive swim items. The Speedo name ensures durability and the brand is constantly experimenting with the latest technology to bring swimmers that take the market by storm. By paying careful attention to small details, Speedo has propelled swimmers to a new place with the Speedo Fastskin 3 collection. should be different for practice than it is for competing in a meet. Swimsuits for practice differ from competitive swimsuits in minor areas, but are still designed for performance. 1. Multiple practice swimsuits are the norm. Because you or your child regularly swim during the week, multiple practice swimsuits are required. Anywhere from 2-4 suits are required, depending on how many practices you or your child have per week. Practice suits are durable enough to be worn many times and rinsed thoroughly between each wear. 2. Know the differences in fabric. Typically practice swimwear is comprised of polyester and Lycra, just like competitive swimsuits. Sometimes practice suits are made of nylon for increased durability. Most Speedo practice swimsuits are made of polyester and Lycra to mimic the same feel and fit that swimmers are used to competing in. The fit of a practice Speedo swimsuit may be slightly looser or relaxed than a competitive swimsuit. This creates less constriction when practicing. 3. Care for your Speedo practice swimsuit properly. Suits should have about 24 hours to rest between wears. Chlorine water puts a lot of wear and tear on a practice swimsuit. Polyester, Lycra and Spandex blends are essentially memory yarns that need time to “snap back” into place after a swim. Let practice swimsuits air dry, but never in the sun light. Rinse the practice swimsuit and place it in the bathroom to drip dry. Sun light can damage a suit’s colors with fading and heat can break down the fibers and elasticity in your swimsuit. Because of this, you also want to avoid drying the swimsuit in the dryer. 4. Reach for quality name brands like Speedo. There’s a reason brands like Speedo have become synonymous with competitive swimming. Speedo deliver the quality you need from swimsuits that are worn repeatedly for practice or competition meets. Speedo swimwear is treated with chlorine resistance for durability and minimal fading even with consistent use. Wearing a Speedo practice swimsuit means wearing quality swimwear that will stand up to the most intense practices. Speedo swimsuits are well-known for a reason in both the practice and competitive realms. For both men and women, boys and girls, Speedo swimsuits offers high quality swimwear meant for swimmers who take the sport seriously. When starting out in swimming there is nothing more frustrating than trying to find the swim goggle that is just right for you. Each swimmer has a different list of requirements for their ideal pair. Beginning swimmers often look for comfort and ease of use while a competitive swimmer might be looking for goggles that cut down on drag. Luckily there is a wide range of goggle styles available for all ages and ability levels. Not sure what goggles would be best for you? Check out our list of the ten best goggle styles and the features that make them so popular. 1) Speedo Vanquisher – The line of Vanquishers easily make the top of this list due to their wide ranging appeal. These are a great goggle for both competitive and recreational swimmers. Vanquishers feature soft silicone gaskets around the eyes for a very comfortable fit. Each pair of Vanquishers also comes with a set of four different size nose pieces. This allows each individual user to select the fit that is just right for them. Vanquishers fit more directly in the eye socket rather than around the eye. The line of Vanquishers includes Junior, Women’s, and Men’s sizes in addition to the newly updated Vanquisher 2.0. Best for: Recreational and competitive swimmers ages 13 and up. 2) Aqua Sphere Kaiman Goggles – Kaiman goggles are popular for their excellent visibility and outstanding comfort. These are a favorite of open water swimmers and triathletes due to their 180-degree visibility and easy-adjust buckles for the perfect fit. Kaiman goggles offer possibly the softest gaskets available in a goggle today. Due to their wider shape Kaiman goggles do not fit directly into the eye sockets, but rather fit more around the eye. The silicone nose bridge is not adjustable; however, due to its soft nature it is comfortable for a wide range of nose types. Kaiman goggles are available in both small and full size models. Best for: Adult recreational swimmers, open water swimmers, triathletes. 3) Speedo Hydrospex – Speedo Hydrospex are a no frills goggle that are ultra comfortable and easy to use. The back strap adjusts with the speed fit clip to make adjustments a snap especially with the new Hydrospex 2. The wide gaskets of the Hydrospex make these an ideal goggle for beginning swimmers. While Hydrospex do have a solid nose piece that does not allow for adjustments they do come in both Junior and Adult sizes to fit a wide range of users. As an added bonus… Hydrospex come in a nearly endless array of colors. Best for: Children and beginning swimmers, anyone who likes wider goggles. 4) Swedish Goggles – Swedish goggles are a swimming classic and long time favorite of competitive swimmers. Popular for the clear view and excellent field of vision they promote. Though these are a favorite of experienced swimmers they do take some getting used to. Swedish goggles must be completely assembled by the user and do not have any soft cushioning for your eye. The hard plastic eye pieces of Swedish goggles fit directly in the eye socket for a very unique fit. Swedish goggles are available in many colors including metallic for the outdoors. Best for: Experienced and competitive swimmers looking for a custom fit. 5) TYR Technoflex – Technoflex are another wide frame goggle that is great for youth and beginning swimmers. Much like the Speedo Hydrospex the TYR Technoflex feature a solid nose piece and easy adjust fit clips on the sides. Soft silicone gaskets make the Technoflex goggles easy on the eyes while giving you clear vision in the water. TYR Technoflex 4.0 are available in a great selection of fun colors. Best for: Youth and beginning swimmers, anyone who likes wider goggles. 6) TYR Swimple – Swimple goggles are the ultimate ease of use goggles. They come in one size designed for kids and come in several fun colors. Swimple goggles have a solid nose piece and soft silicone gaskets that are easy on children’s eyes. The easy adjust release button on the sides of the goggles allow for no fuss adjustments of the back strap. These goggles will have your kids splashing around in no time. Best for: Kids who enjoy recreational swimming. 7) Speedo Aquasocket – Aquasockets were engineered with competitive swimmers in mind. Their ultra low profile design ensures minimum drag through the water. These goggles fit directly in the eye sockets with their soft silicone gaskets for a snug comfortable fit that will not come off in competition. Aquasockets also come with multiple size nose pieces to allow for a more customized fit. Best for: Competitive swimmers ages 13 and up. 8) TYR Tracer – Tracer goggles are another model designed with the racer in mind. Tracers fit directly in the eye socket but are not rough on the eyes thanks to the soft silicone material. They also feature various size nose pieces so you can pick the one that fits you best. Tracer goggles offer excellent peripheral vision for a racing goggle. Best for: Any swimmer that measure’s success by the tenth of a second. 9) Aqua Sphere Seal – The Aqua Sphere Seal mask is somewhat of a cross between a goggle and a snorkeling mask. The Seal mask has a much larger profile than most goggles, but does not cover the nose like a typical mask. This allows it to function as a normal goggle while providing more of a full face coverage. The Seal mask is well know for the excellent seal it makes between the goggle and the face. This makes it great for swimming in turbulent waters. The Seal mask is available in the original and XP Seal mask version with a lower profile. Best for: Open water swimmers and swimmers how like full coverage from their goggles. 10) Speedo Sprint/Pro – These are a few of Speedo’s classic goggles. Both styles are made with soft foam around the eyes and come with an adjustable nose piece. Pro goggles have a circular shaped eye piece while the Sprint style has more of an oval shaped eye piece. These goggles have been a staple of the swimming community for some time due to their reliability and comfort. Best for: Goggle traditionalists and anyone who prefers foam gaskets over silicone ones. There is no better time to stock up on practice suits than right now. D&J Sports female grab bag suits start out as low $32 each. You pick the size and D&J Sports will send you a brand new Lycra Speedo, Nike, TYR, or Dolfin swimsuit. If you need to stock up on swimsuits you will also stockpile the savings with additional discounts. Men’s grab bag suits are also available starting out at just $15 for briefs and $24 for jammers. SPEEDO EXTENDS PARTNERSHIP WITH MICHAEL PHELPS THROUGH 2013! LOS ANGELES (September 9, 2009) – SPEEDO® today announced the extension of its long-time partnership with swimming superstar Michael Phelps through 2013. Following his historic 8 Olympic Gold Medal haul in Beijing, Phelps’ career-spanning commitment to the Speedo brand and a shared passion to help grow the sport of swimming globally now continues through the 2012 London Olympic Games and beyond. A Team Speedo star since 2001, Phelps’ relationship with Speedo goes beyond a traditional endorsement contract. Phelps used the $1 million bonus he earned from Speedo for his record medal haul in Beijing to start the Michael Phelps Foundation, a charitable organization committed to growing the sport of swimming. As part of Phelps’ new Speedo deal, the brand will donate $10,000 to the Michael Phelps Foundation for every World Record Phelps sets; Phelps has committed to match each donation as well. Phelps will also continue to serve as part of an athlete advisory group to the Speedo Aqualab, the research and development center that continually pioneers new technologies and innovations in swimwear and accessories. In 2008, it introduced the Speedo LZR Racer, which Phelps wore for every gold-medal-winning swim in Beijing and at the 2009 FINA World Championships in Rome. In the coming months, Speedo will announce an updated – and comprehensive – range of elite swimwear that conforms to newly released FINA rules. Phelps made history by winning eight gold medals at the 2008 Olympic Games – the most for any athlete at a single Games. During the nine-day competition in Beijing, Phelps set seven World Records, eight American Records and eight Olympic Records to become the most decorated athlete in Olympic history with 14 gold medals. As he looks ahead to the 2012 London Olympics, Phelps continues his assault on the history books. At the 13th FINA World Championships in Rome this summer, Phelps accomplished another personal and historic goal, setting a new World Record of 49.82 in the 100m butterfly to become the first man to break the 50-second barrier. The Baltimore native continues to train at the North Baltimore Aquatic Club under long-time Speedo coach Bob Bowman. Phelps is represented by Peter Carlisle, Managing Director of Olympics & Action Sports, Octagon. Team Speedo swimmers include Olympic Gold Medalists Natalie Coughlin (USA), Ryan Lochte (USA), Katie Hoff (USA), Libby Trickett (AUS), Eamon Sullivan (AUS), Park Tae Hwan (KOR) and Rebecca Adlington (GBR).